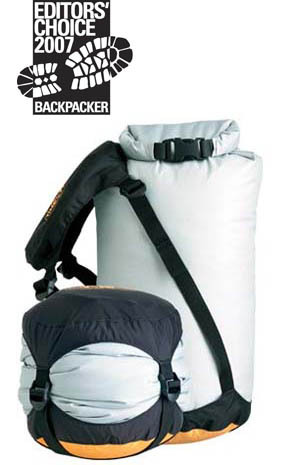 The compression dry sack is made of 70D nylon lid and body with an eVent base. The seams are double-stitched and tape-sealed. The eVent base allows air escape during compression while still preventing water from getting in. The bottom of the sack has a pull handle to more easily dump out the contents of the sack. The top of the sack is a Hypalon roll top with a buckle closure. The lid has four straps to evenly compress the load. The manufacturer recommends use of this sack for all water situations that do NOT involve submersion of the sack. We purchased the Sea to Summit compression dry sack in 2012 when we still used a two-person down sleeping bag for all of our backpacking. We had used that sleeping bag without a compression sack for years and it ended up stressing the backpack seams to the point of failure. Overall this sack has spent approximately eleven days on the trail. Sylvia Lake, Desolation Wilderness, California: 2 nights; 20 mi (32 km); 6,700 to 9,983 ft (2,042 to 3,043 m) elevation; 25 to 65 F (-4 to 18 C) with clear to partly cloudy conditions. Pacific Crest Trail, California: 3 nights; 31 mi (50 km); 8,160 to 10,536 ft (2,487 to 3,211 m) elevation; 37 to 75 F (3 to 24 C) with clear to partly cloudy conditions. Hetch Hetchy, Yosemite National Park, California: 3 nights; 32 mi (52 km); 3,900 to 7,400 ft (1,189 to 2,256 m); 35 to 70 F (2 to 21 C) with clear conditions. I don't use pack covers or pack liners but rather prefer to keep my clothing in one dry sack and my quilt/sleeping bag in another. This way I keep my critical items dry without the hassle and weight of other rain protection options. A compression sack seemed like a good idea to get the large sleeping bag into a smaller size for better packing. We have since changed to a much smaller quilt in summer but still use the sleeping bag and thus the dry sack for winter snowshoe backpacking. The compression straps and sturdy fabric make this sack heavier than my other dry sacks, but when I really want the confidence that my sleeping bag will stay dry, I find it to be well worthwhile. The compression straps took a little getting used to for me since I don't typically use compression sacks. 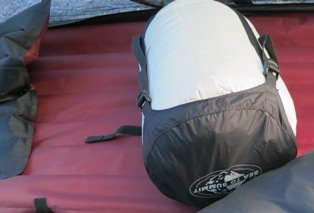 And with the large bulk of the sleeping bag it was a little unwieldy to get the lid and straps positioned correctly. But once I figured it out, it isn't difficult to operate. To use the sack I stuff in my sleeping bag far enough that I can get at least three rolls on the roll top strip before buckling (per what the manufacturer recommends). Then I position the lid on top of the rolled end and begin tightening the straps in an even manner. The sack expels air as I tighten the straps and before I know it my basketball-sized load is down to a volleyball-size. I could easily continue tightening to a cantaloupe-size but I don't see the need to go that far. This package now fits in my pack easily. Then when removing it, I simply loosen the straps and slip the lid off to the side. Then I unbuckle the roll top and start removing the sleeping bag. The handle on the bottom is really useful especially with the compressed contents. Overall the eVent compression dry sack has definitely found its spot in my gear list. Although it isn't something that I use all of the time, it serves a critical purpose when needed.